Complete dentures are basically the dental restorations for patients who don’t have their natural teeth. Once teeth are removed, the supporting bone starts to shrink or resorb over time. It often leaves a bit of structure to rest dentures on and it often makes dentures hard to control. Usually, complete dentures are made of high density and modern plastic materials, along with the teeth. Replacement teeth are very esthetic and natural looking. Dentures are usually made of acrylic resin which sometimes has metal or porcelain for extra support. 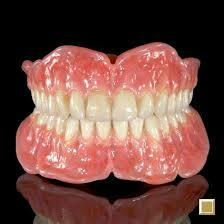 We have finely-crafted and custom fitted complete dentures. Well-maintained dentures appear natural and result in a cute smile. In addition, they also strengthen muscles which need your teeth’s support to control your expressions and help you get rid of pronunciation and chewing issues due to missing teeth. If you are losing or lost all of the teeth, you must fix an appointment with us to discuss about complete denture. If some of your teeth are healthy, you may want to go with partial denture. This procedure should be discussed well with your dentist as you need to consider several medical and personal factors. You may want some teeth extraction and surgery to improve your smile and strengthen your dentures.